Hungary is a republic in middle Europe. The Danube flows through the capital, Budapest, which has about 2 million inhabitants.The official language is Magyar (Hungarian) with a Latin-based alphabet. It is said that the people are of Finno-Ugric and Turkic descent, mixed with local peoples. Most Hungarians are either Roman Catholic or Protestant. The Hungarian Forint is (still) the unit of currency. The climate is sub-mediterranean in the south and cooler in the north. Seasons are well defined - winters are cold and summers are hot. Most of the country is low-lying and drained by the Danube and the Tisza, its tributary. A limestone ridge, the Bakony Forest, separates the fertile, hilly Little Alföld in the north-west from the Great Alföld, or Hungarian Plain - which covers about half the country. The highest point in the country is Mt Kékes (1015 m). Arable land, orchards and vineyards cover half of the country, and about a third of the land is pasture and forest. Corn and wheat are the main crops. King Stephen founded the state in 1000. Between 1867 and 1918, Hungary and Austria jointly controlled the great Austro-Hungarian Empire. In World War II, it was invaded by Germany, its former ally. Later, Soviet forces occupied Hungary and a communist government was in power until 1989. Hungary joined the European Union in 2004. Hungarians or 'Magyars', as they call themselves, number around 10 million. At over 90,000 km2, the country is slightly larger than its neighbouring Austria; however, in spite of its relatively small size, it has a remarkably illustrious history as well as international fame. Goulash, paprika, Tokaj wine, and Ferenc Puskás - one of the deadliest left-footers in soccer history - come to most people's minds when you mention Hungary. North-east of Budapest are the hilly regions that produce the country's most famous wines - Tokaj and Bikavér (Bull's Blood). Having said that, you must also try the equally delicious wines from Villány and Badacsony. Thermal baths and spas abound in Hungary. The hot springs were well known to the Romans and, later, to the Turks who occupied the country for 150 years. Wherever you go in Hungary you can be sure to find a thermal bath or a spa in the neighbourhood. Interestingly, despite the lack of a coastline, Hungarians have a tremendous affinity with water: there are many popular lakes - the huge Balaton for one - and fishing-ponds. The national water-polo and swimming teams are second to none. Collectors of fine porcelain will have heard of at least three of Hungary's best known producers: Herend, Holloháza, and Zsolnay. Herend, in its day, was a supplier of ceramicware to royalty across Europe. Just stroll around the streets of Pécs to appreciate Zsolnay's metallic-glazed 'Eozin' tiles and decorative fronts on select buildings and palaces. Szolnok county , Tisza lake area and Puszta. Hungary's great, perhaps greatest poet, Sandor Petofi, was bewitched by the landscapes and life of this region. So - like Petofi - be sure to make this a part of your Hungarian experience. Lovers of water-sports and fishing must not miss the Tisza lake - one of the many popular features of central Hungary. For those of us more gastronomically inclined, there is the substantial cuisine of the 'Puszta' to enjoy - gulyasleves being particularly reknown. Here you will see the classic 'tanya' - a relatively isolated and self-sufficient farmstead, where you are free to go about your business far away from the madding crowd. The expression - My home is my castle! - very much applies here. Borsod, Heves, and Nograd counties. Mountains, forests and streams abound here. Is this the sort of setting that suits you? Go skiing in the Matra range, explore the caves and underground lakes of the Aggtelek hills, or challenge yourself to a 1094 kilometre hike along the National Blue Walk. Perhaps you would rather go wine-tasting in Tokaj, or sit back and relax in the Zsory medicinal baths. The Tisza lake and northern tip of the Great Plain are easily reachable. Somogy, Baranya, Tolna counties, and Balaton lake area. The south west enjoys an exceptional sub-mediterranean climate. Landscapes can be very varied: there are the flat areas near to the Drava river; some quite steep areas in the Mecsek hills; and the unforgetable Balaton, itself. 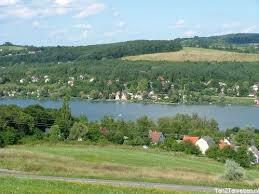 On the whole, though, the gently rolling hills are most representative of this very attractive part of Hungary. Spend a few days exploring the pleasant historic towns. The lively city of Pecs has Hungary's first ever university dating back to 1367, the Gazi Kaszim Pasa Mosque - a legacy of Hungary's Ottoman period, and the Zsolnay porcelain factory. Visit Kaposvar's nationally famous Csiky Gergely Theatre, and stop by in Szigetvar to admire the fortress - site of a tremendous battle with the Ottoman Turks.